Tulsa artist Rena Detrixhe shipped 250 pounds of red Oklahoma soil to Boston. Then last week she spread it on the floor of Abigail Ogilvy Gallery. It’s not just any soil. Detrixhe has ground and sifted it, and it’s almost as fine as flour. She covered 120 square feet in the middle of the gallery, and went to work stamping it with the cut-up soles of discarded shoes. 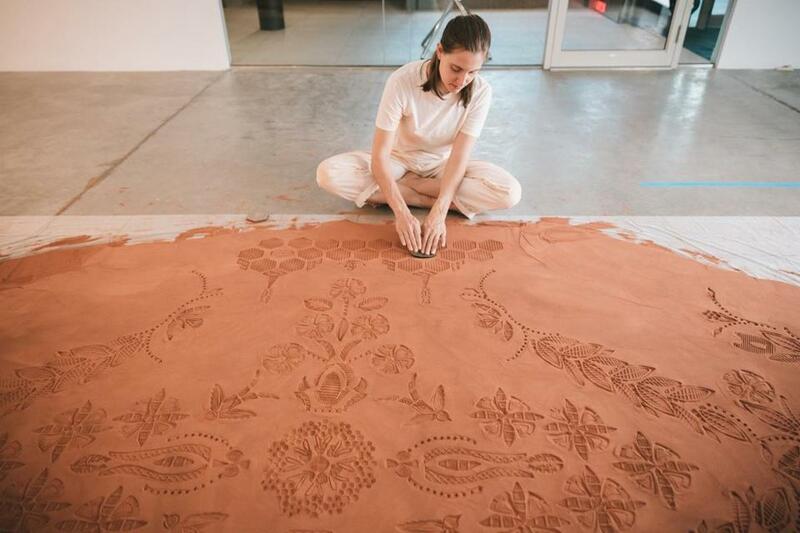 The piece, “Red Dirt Rug,” is her ninth soil rug and has the branching pattern and borders of a Persian carpet. The symbol-laden designs are purely Oklahoman, with oak leaves, vortexes of wind, and spouting oil wells revolving inside circles of pump jacks. Intricate, soft, and easily disrupted, it’s an admonition against heedless use of the land. “I talk about Oklahoma as a place drastically altered by human presence,” Detrixhe said last Friday, when she was putting finishing touches on the piece. The past century has seen a sharp rise in the state’s population. Repercussions on the land and its inhabitants include the environmental disaster of the Depression-era Dust Bowl, oil drilling, and fracking. There’s also been a rise in real estate development. Gallery owner Abigail Ogilvy sees parallels between human intervention in the Oklahoma landscape and historic development in Boston. When the show closes at the end of the month, there will be a ceremony and “Red Dirt” will be swept up like a Tibetan sand mandala. “Red Dirt” is not the artist’s last carpet. The soil will be shipped home and made into more installations. Sand from the Tibetan mandalas is spilled into riverbeds. When Detrixhe has made her last dirt carpet, she, too, will return her material to its source. Earth to earth, dust to dust.